Introducing the next generation in clearomizer technology 510 clearomizer bottom coil for the Joye510 e cigarette category. No leaks and No burnt taste. Simply un screw the top and fill using the e liquid bottle. 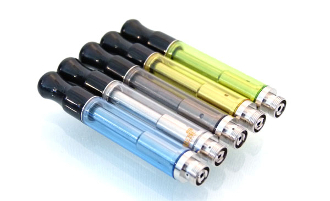 To fill the 510 clearomizer, tilt it on it's side and avoid getting liquid in the center part. The 510 clearomizers are roughly 2.4 - 2.6 ohms. Add additional clearomizers and save. Due to the nature of this type of product there is only a 24 hour DOA warranty. Don't miss out on the liquid capacity, great taste, and vapor production that come with larger models of electronic cigarettes. Our Joye 510 Clearomizers provide all of those qualities while keeping it small and sweet allowing you to continue using our cigarette style Joye 510 Batteries. These clearomizers are completely fool-proof. Just screw onto your battery, fill with your preferred liquid, and vape! Once it burns out just toss and replace!